With all the wonderful weather we are having in the UK at the moment, there is nothing better than sitting under a nice cosy blanket or quilt, with a warming cup of tea and a good book or a great movie. I love blankets; they can really make your home feel…. homely. If you are in a rental they can make even the ugliest sofa beautiful and they can also become a wonderful heirloom to pass down the generations. Blankets can be made from anything, knitted or crochet, patchwork, quilted, woven, plaited the possibilities are endless. Blankets of all kinds have such amazing history. Take the American quilts for example. 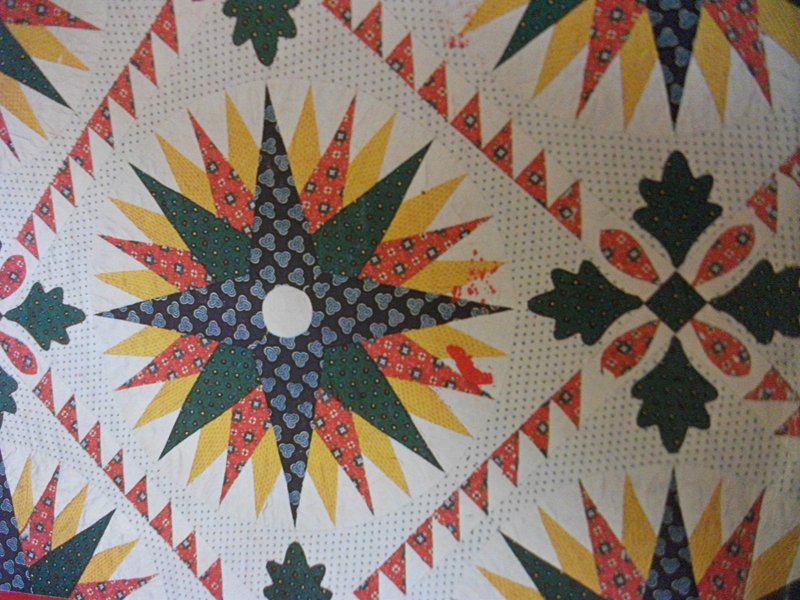 After the War of Independence, American cotton manufacturers found it difficult to compete with European and British imports and textiles were expensive so small scraps were used in geometric shapes to create quilts. By the mid 19th century designing a patchwork quilt had become one of the major forms of domestic folk art. 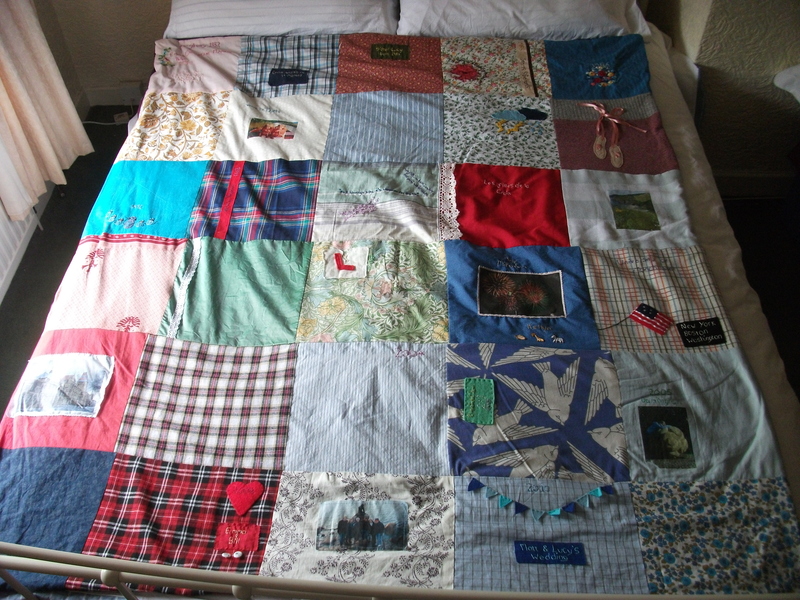 Traditionally an American girl should have up to 12 quilts in her ‘hope chest’ with a 13th being her Bride’s quilt. Quilting blankets became a major social event with ‘Quilting Bee’s’ taking place where pioneer women who lived far apart would meet up (Betterton 1982: 7-8). 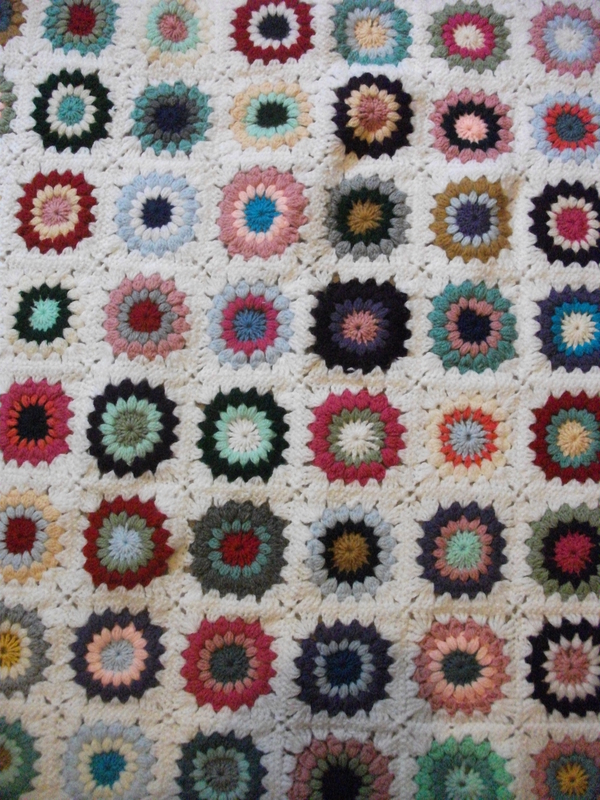 Another wonderful type of blanket is the Welsh Quilt or Carthens. All are woven on a Dobby loom, two different pieces of cloth being woven together to form a double cloth. These are heavy blankets weighing over 2 kilos. The most recognisable of Welsh blankets were made across Wales from C18th. Some are still produced at the few surviving Mills such as Rock Mill Capel Dewi , Middle Mill sova and Tregwynt in Pembrokeshire. (http://www.welshblankets.co.uk). I love making blankets of all kinds and so am sharing a few of my creations here with you so you can see my eclectic love of craft. I will never be able to choose one favourite crafting method, every time I look in a book, read a craft magazine or browse another crafters blog I find a new technique I want to try out and end up loving. Crochet, patchwork, quilting are all methods I love. I am not a great knitter and a blanket would probably take years not days. My next aim is to learn more about weaving. My mum can both spin and weave so I may have to go to her for a few handy tips to start me off. The above blanket was my first ever crochet project. I taught myself so that I could teach a friend. I found it incredibly difficult as I am left handed and therefore have to reverse all of the instructions you find in books. The left handed crafter is definitely at a disadvantage when it comes to craft books and guides. 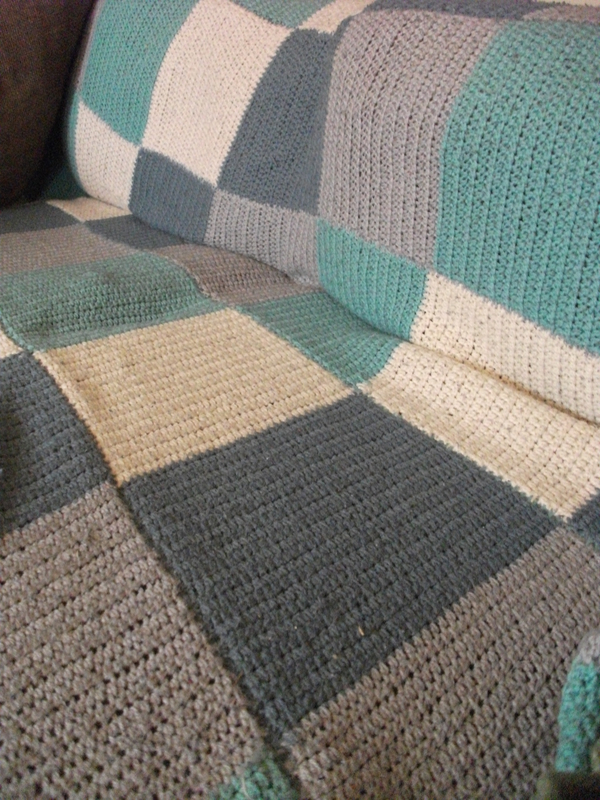 This blanket I started and just kept adding to it and ended up with a huge double blanket but I was so happy with it and it now has pride of place on my sofa. This second one is still a work in progress. I found it in a magazine and loved the pattern so much that I decided to make it. 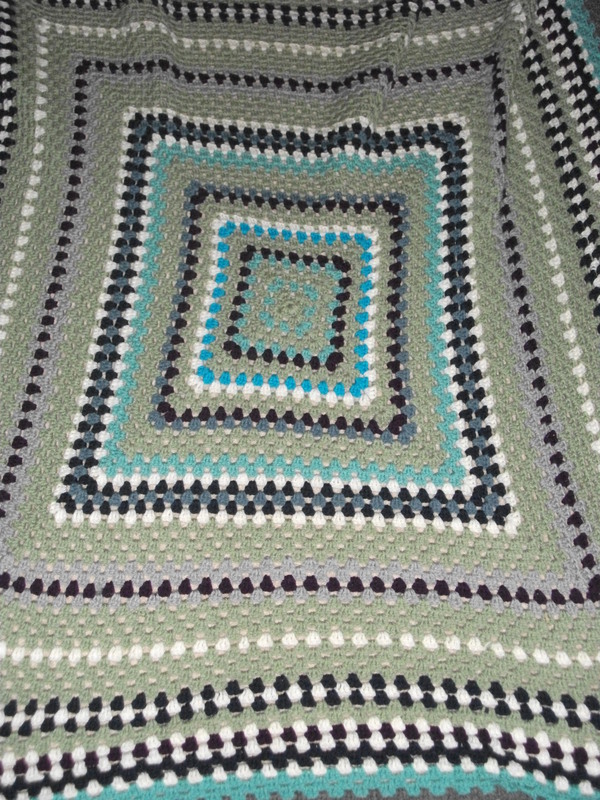 It is great as you can use all your wool odds and ends as no two squares have to be the same so very economical! Third is a blanket I made my parents for Christmas, I love the colours together. This is one of my favourite blankets I have ever made. I made it in January this year for my sister Emma’s 30th birthday. 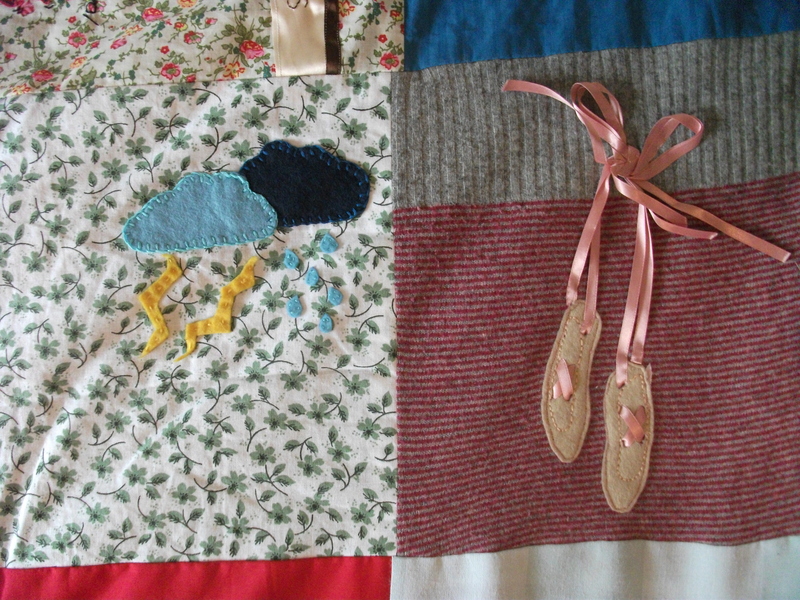 The idea is that of a memory quilt. 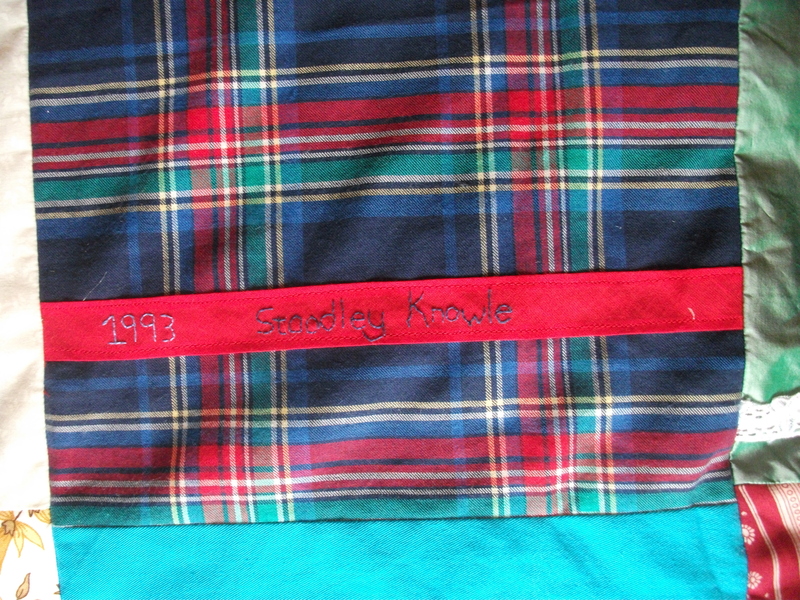 I cut out 30 squares of different fabrics, some with meaning such as the tartan of our school kilt, some of Emma’s old clothes and some of my grans fabrics and then embellished them. 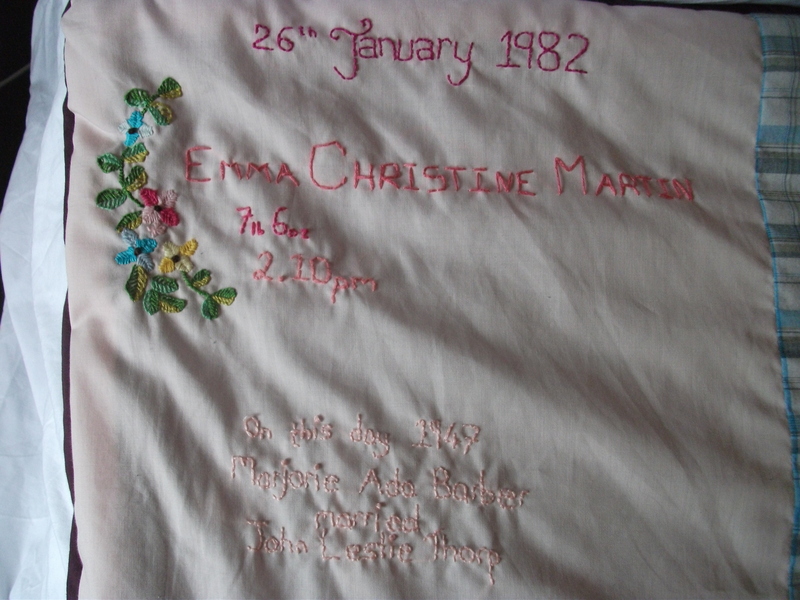 Some square have embroidery with significant words, dates and occasions. Others have photographs printed on or appliqué. I left a few plain as I didn’t want to overload it. It is a warm blanket as inside is a layer of wadding and it is backed in a plum coloured cotton. It fits a double bed so pretty large but I wanted it to make an impact when I gave it to her. This blanket I was commissioned to do as a present for a baby. 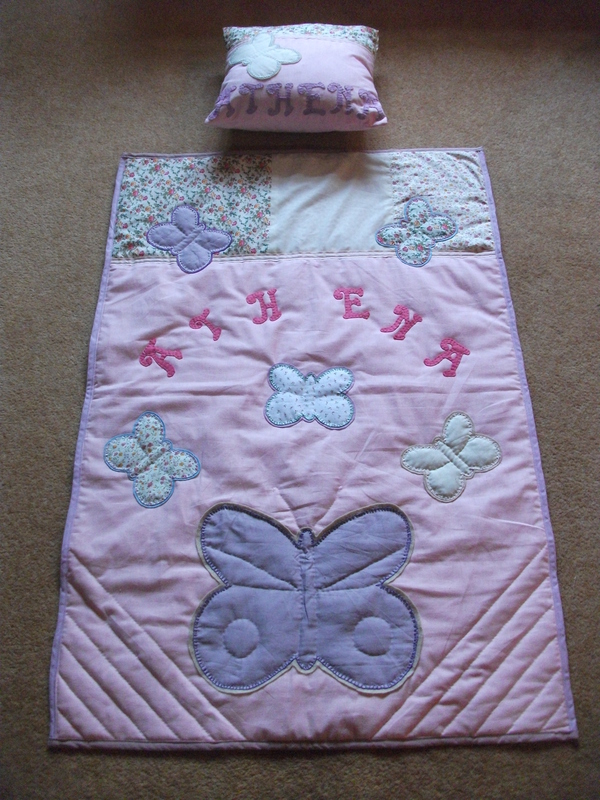 Both the pillow and the quilt are personalised with the little girl’s name. The client said that I could design the blanket myself with anything the only instructions being that it had to be pink and girly, hope fully the finished blanket achieved this. I loved doing this project, I think creating something with a personal touch that you know someone will treasure is such a wonderful thing for a crafter or artist. Has anyone else made a blanket or quilt? What is your favourite crafty method? Let me know your latest blanket project. If you are interested in commissioning a blanket please feel free to contact me to discuss it further, I am always happy to hear from you.